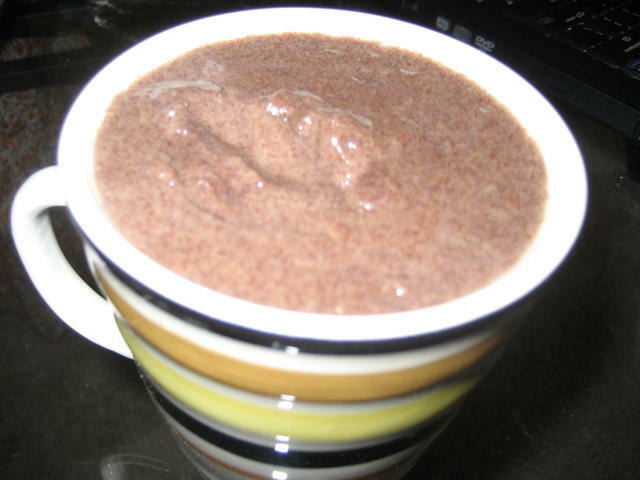 I haven’t used ragi ever …and till now I thought it was something like other grains – just buy it and cook it. All this sprouting thing is confusing me. Can anyone please explain how its done? Or how can I introduce ragi to my daughter? Do I need to sprout it? You can cook whole ragi directly, in upma and other preparations, but as a baby food, it is typically ground into flour and made into porridge. You can eat it without sprouting, but sprouting improves its nutritional value. Some (like me) also prefer the taste of sprouted ragi flour. In rural households, sprouting ragi at home is part of the routine work in the kitchen, just like cutting vegetables or making yougurt – even though one can buy ready-made yougurt or pre-cut vegetables in the urban supermarkets. You will retain more nutrients and flavour if you buy your ragi whole and process it at home. When my sister bought a flour grinder, I could easily taste the difference between bread baked with flour ground on the same day as compared to week-old flour. Renewed interest in slow food has inspired urbanites to learn from their rural cousins. Here is a beautiful site explaining how to sprout the ragi at home. You can also buy sprouted ragi flour. Our first packet came from a company called Dharani (Bangalore) and later we got it from Ecofarms, based in Yavatmal, or Conscious Foods (Mumbai) and now from Satvika, just a hop skip and a jump from us in Chembur. In short, sprouted ragi flour is sprouting up everywhere 🙂 As more urban folks are becoming aware of its nutritional value and also forgetting the art of sprouting at home, the price of sprouted ragi flour has steadily risen and currently in Naturally Yours, our local organic shop in Chembur, the price is Rs. 70 for 500 grams. Whole ragi comes for Rs. 49 per kilogram. Since ragi absorbs some water during the sprouting process, you will need to add less water when cooking sprouted ragi flour than when cooking unsprouted ragi flour.An internet search quickly yields several recipes for ragi porridge but all of them involve additional ingredients that we do not want to include in baby’s first food. This ragi porridge is so simple it hardly merits a recipe, but then some people won’t believe it can be done so simply unless they see it described in loving detail on an internet site, so here we go. 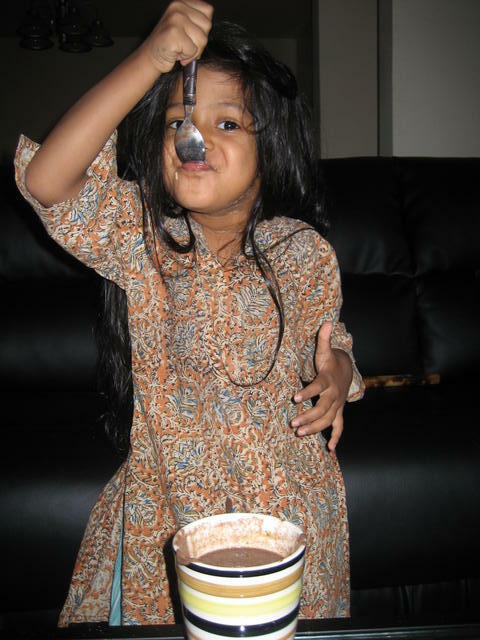 Khiyali demonstrates how to make ragi porridge. 1/4 cup ragi flour or 1/3 cup sprouted ragi flour. In a pot, mix the ragi flour with cold (room-temperature) water. Stir vigorously with a fork till it is nicely dissolved and there are no lumps. Slowly bring to a boil over medium flame, stirring continuously. As it comes to a boil, it thickens. Once the ragi is thick, remove from flame and let sit for 10 minutes. If you prefer a thicker porridge, you may increase the ragi by a spoon or two – just play around till you have the consistency you like. To get a thick porridge using sprouted ragi flour, I usually use 1 cup flour with 2 cups water, as demonstrated in Ragi Porridge: the video. You can double the water if you want to have it as a drink. For babies, this is ALL you want to use. No salt, sugar, milk, or nuts. Eaten fresh and warm, this is a satisfying porridge all by itself. Why do we not add anything else? Here are some reasons for avoiding the following common ingredients, when preparing food for babies and young children. Milk – Babies absorb iron from breastmilk very well, especially when no other sources of iron are in the stomach at the same time. So don’t mix baby’s ragi with breastmilk – that will lower the absorption of iron. Don’t mix it with cow’s milk either. Ragi (especially sprouted ragi) is high in calcium and iron, and cow’s milk makes it more difficult to absorb iron from foods (See Iron Deficiency). For human babies, (other) animal milk is nutritionally inferior to mother’s milk and also inferior to ragi. Why fill baby’s stomach with an inferior food? Nuts – In light of the rise of allergies particularly in Western countries and other parts of the world adopting Western lifestyles, a number of health specialists recommend delaying nuts till age 2, and in particular delaying peanuts till age 3. One must be even more cautious if there is a family history of allergy. Even nursing mothers are advised to avoid nuts until the child is old enough to have nuts. If you aren’t living in a western lifestyle, and have no family history of allergies you may take this caution with a grain of salt, as it were. Added salt – Give your baby a chance to taste food as it is, without added salt. Salt has its place and there is nothing wrong with eating it but one should not depend on salt to make food tasty. One should be able to enjoy the taste of plain vegetables or grains. Delaying salt till at least 12 months allows the palate to grow accordingly. Added sugar – same logic as above. Let babies and children taste the flavours already there in foods, without depending on added sugar to render things sweet. By delaying added sugar till age 4 or 5 years, one can get used to a variety of flavours, build healthy eating habits, and also diversify one’s repertoire for desserts and treats that use the sweetness already there in fruits and other whole foods. Video: EZ Cooker is good for ragi too. Of course even on the stove it cooks quickly, but you can shave a minute or two off the stovetop time by transferring to the EZ cooker once it starts to boil. Once it is in the EZ cooker it cannot burn or boil over. It will not thicken as much as it would on the stove but if you like a softer porridge this is just right. Many a days Disha and I have sprouted ragi porridge with cut up dates for breakfast and we love it! Its so filling that I don’t feel hungry for a long time after. And I love the flavor of sprouted ragi- makes my mouth water just thinking about it. It’s nice to have in the evening too, especially in the winter. We ate ragi with chopped సపోటా (chiku) the other day it was truly delicious. Aravinda and others does any body know where we can find sprouted raagi or whole raagi or order that online from US. Whole millet should be available in your local grocery store – either the general grocery store or a natural foods store that specializes in diverse whole grains. If it is not on the shelf, they would probably order it for you if you asked them. While there you may want to experiment with grains native to your locality as well. I have checked it at whole food and a lot of other stores but I couldn’t find it here.. May be I should ask them to order it. I have been using the regular raagi flour that is available for many years now. But after seeing this beautiful video I now think that sprouted raagi indeed is more softer in texture and may be taste better as well, no? Some day I will sprout it myself, but meanwhile, I am glad it is available in the store. Pingback: What's on your plate: 15 mouth watering ways of eating Millets!